The Omidyar Network makes a compelling case for a sector-based approach to impact investing. Originally published in the Social Impact Bond Tribune. Another is the publication of “Priming the Pump: The Case for a Sector-Based Approach to Impact Investing,” a six-part series by ON’s Matt Bannick and Paula Goldman (with assistance from Jayant Sinha and Amy Klement, an observer of Social Finance US’s board) in the September 25, 2012 issue of the Stanford Social Innovation Review. The articles are important not only for the insights they provide about what it will take to realize the full potential of impact investing, but what they portend about ON as a new kind of foundation. Herewith, a brief summary with editorial comments. Second, they identify three categories of actors “meant to apply to the development of for-profit markets for social impact,” rather than those served primarily by grant-making. The “market innovators” believe in a product or service before its profit-making potential has become obvious. Their job is “derisking the generic model of an innovation or product,” so it shouldn’t be surprising that these “high beta” firms have the greatest unmet need for patient impact investment. This analysis moves beyond the anecdotal experience of many in the impact investing space to a compelling argument for a fundamentally different rationale for the new generation of entrepreneurial foundations. 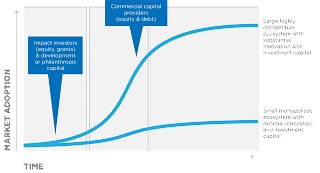 More than just a call to action by their peers, the “Priming the Pump” framework reveals why the emergence of a robust impact investing marketplace cannot be assumed, but instead won’t take off unless it is nurtured by a new cadre of funders who see capital market innovation itself as a strategic objective. Here, the authors address a surpassingly important question, “When, and in what circumstances, is subsidy appropriate?” They thoughtfully compare the risks of firm subsidy—preventing a level-playing field for competition; subsidizing firms with limited scaling potential are an “inefficient use of capital”; and compromising the promise of the impact investing industry; with its positive uses—spurring market development; catalyzing other models of scale, and creating a pipeline for the impact investing industry. If there is one place the authors fall a bit short, it would be the installment that considers the role of government. While they appreciate the “urgent need ... to align interests between those who are trying to serve disadvantaged populations from a business perspective and those in government who feel they represent the disadvantaged,” they don’t quite achieve the same level of insight they displayed in analyzing the role of different types of foundations. Just as we need more enlightened foundations to make below-market-rate investments in innovators and infrastructure firms, we need to identify the factors that make government officials and their positions truly “supportive” of impact investing at scale. In fact, there are attributes on both sides of the political aisle that lend themselves to fostering a more conducive environment for impact investing at the sectoral level, so there will be an opportunity to supplement Bannick’s and Goldman’s model. I’ll offer just one observation now. The authors link to what is indeed “an excellent overview on the ways in which government can help drive a more entrepreneurial environment,” by Daniel J. Isenberg, a professor of management practice at Babson College and executive director of the Babson Entrepreneurship Ecosystem Project. But Professor Isenberg’s worthy objective is to distill practices that “help build a vibrant business sector.” Although business growth can certainly help reduce poverty, the advent of impact investing has been spurred by the need for more than just traditional enterprise. Part of the reason that much of social investment lives in the “gray space” between grants and market-rate investments is that we need to scale innovations, like prisoner reentry programs and permanent supportive housing, that span the public and private sectors. Government needs to support impact investing not to help business or even nonprofits grow, but to improve the effectiveness of government itself. We need to look for new structural models that are conducive to impact investing, perhaps along the lines set by Stephen Goldsmith and William D. Eggers in their seminal book, Governing by Network: The New Shape of the Public Sector. SOURCE: Matt Bannick & Paula Goldman, “Priming the Pump for Impact Investing: Part VI: Achieving Takeoff,” Stanford Social Innovation Review (Oct. 2, 2012). Now that’s a prescription I can endorse. In fact, I offered a similar approach in my book for using performance-based philanthropy to scale growth-ready nonprofits. In both cases, there are well understood models for exponentially increasing market adoption of disruptive innovations, of which the social sector and their funders are largely unaware. 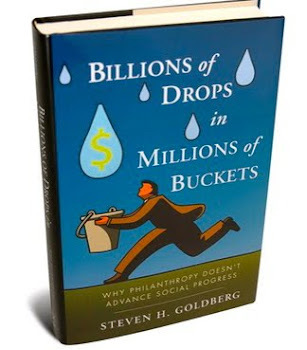 SOURCE: Steven H. Goldberg, Billions of Drops in Millions of Buckets: Why Philanthropy Doesn’t Social Progress, Exhibit 3.9, p. 108 (Wiley 2009). I’ll confess to a certain amount of ambivalence when proponents of impact investing look to foundations as some kind of deus ex machina. Bannick and Goldman don’t indulge in wishful thinking. Instead, by identifying a special role for a specific class of foundations whose experienced teams should appreciate the insights and analysis of “Priming the Pump,” ON just might be leading the impact investing market exactly where it needs to go. Prior to becoming an independent social investment advisor, Steve Goldberg was the Managing Director and General Counsel of Social Finance, Inc., a U.S. nonprofit that works to connect the social sector with the capital markets to finance effective nonprofit organizations driving social change. See www.socialfinanceus.org. He is the author of Billions of Drops in Millions of Buckets: Why Philanthropy Doesn't Advance Social Progress (Wiley 2009), which has been favorably reviewed by the Wall Street Journal, the Philanthropy Roundtable, and The Aspen Institute. Speaking engagements include conferences of the Harvard Social Enterprise Conference, Growth Philanthropy Network, Social Capital Markets 2010, and the Hudson Institute. Previously, Steve was the consulting project lead for “Charity Navigator 2.0,” a collaborative partnership to guide more money to effective nonprofits. He has provided consulting services to New Profit, Inc., Root Cause, and Commongood Careers, and served as Interim Chief Operating Officer to Cradles to Crayons. He was selected by the Corporation for National and Community Service as one of 60 expert reviewers for the Social Innovation Fund. Copyright 2010 Steven H. Goldberg. All rights reserved. Awesome Inc. theme. Powered by Blogger.